TransIT-X2 Dynamic Delivery System은 non-liposomal, polymeric system을 이용하여 primary cell을 포함한 다양한 cell type에 뛰어난 효율을 보입니다. TransIT-X2 Dynamic Delivery System은 DNA와 siRNA/miRNA의 각각의 transfection에 이용할 수 있으며, DNA와 siRNA/miRNA transfection 가능합니다. TransIT-X2 은 transfection후에 배지 교환 필요하지 않으며, serum이 포함된 배지에서 transfection이 가능합니다. TransIT-X2 Dynamic Delivery System은 거의 모든 cell type에서 transfection이 Lipofectamine2000 제품보다 우수한 성능을 가지고 있습니다. 효율 – 광범위한 범위의 세포의 transfection이 우수함. 전환 – plasmid DNA와 siRNA co-transfection 가능. 기술 – 독창적인 non-liposomal, polymeric technology. Figure 1. Visualization of High GFP Expression using TransIT-X2™ Dynamic Delivery System. TransIT-X2™ Dynamic Delivery System was used to transfect plasmid DNA encoding EGFP into A549, CHO-K1, HepG2, LNCaP, MDCK, PC12, primary human mammary epithelial cells (HMEC) and normal human dermal fibroblasts (NHDF). Transfections were performed in 35 mm MatTek dishes using 4-8 µl of TransIT-X2™ to deliver 2 µg of DNA. Images (32X) were captured at 48 hours post-transfection using a Zeiss Axiovert S100 inverted fluorescence microscope. Figure 2. High GFP Transfection Efficiency in Multiple Cell Lines and Primary Cells using TransIT-X2™ Dynamic Delivery System. TransIT-X2™ Dynamic Delivery System was used to transfect plasmid DNA encoding EGFP into A549, CHO-K1, Hep G2, MDCK, LNCaP, PC-12, primary human mammary epithelial cells (HMEC) and normal human dermal fibroblasts (NHDF). Transfections were performed in 96-well plates using 0.2-0.4 µl of TransIT-X2™ to deliver 0.1 µg of DNA (2:1, 3:1 or 4:1 reagent: DNA ratio). Triplicate wells were assayed 48 hours post-transfection using guava easyCyte™ 5HT Flow Cytometer. Figure 3. Functional Co-delivery of Plasmid DNA and siRNA using the TransIT-X2™™ Dynamic Delivery System. TransIT-X2™ Dynamic Delivery System was used to transfect plasmid Cy®5 labeled DNA encoding nuclear YFP and Cy®3 labeled siRNA into HeLa cells. Transfection was performed in 6-well plates with Poly-L-Lysine (PLL) coated coverslips using 4 µl of TransIT-X2™ to deliver 2 µg of DNA and 25 nM siRNA (2:1 reagent:DNA ratio). Actin cytoskeleton was stained using Alexa Fluor® 350 Phalloidin. 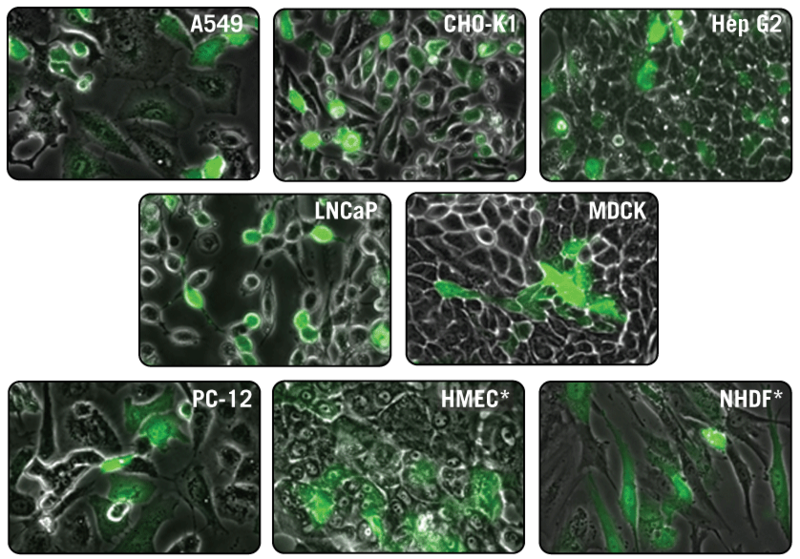 Images (63X) were captured at 24 hours post-transfection using a Nikon A1R confocal microscope. Image key: yellow (nuclear YFP), blue (Cy®5 labeled DNA), red (Cy®3 labeled siRNA), green (actin cytoskeleton). Figure 4. TransIT-X2™ Dynamic Delivery System Achieves Higher Knockdown than Lipofectamine® 2000. TransIT-X2™ Dynamic Delivery System and Lipofectamine® 2000 Transfection Reagent were used to transfect siRNA targeting endogenous proteins – GAPDH and AHA1 or to deliver a non-targeting siRNA control in normal human dermal fibroblasts (NHDF). 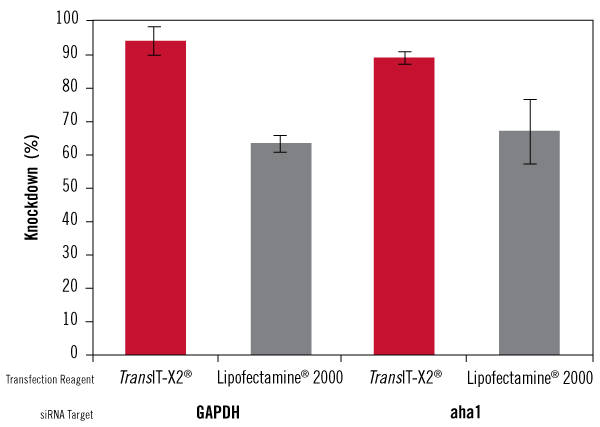 Cells were transfected in a 6-well plate using 4 µl of TransIT-X2™ or 6 µl of Lipofectamine® 2000 and 25 nM siRNA according to each manufacturer's protocol. 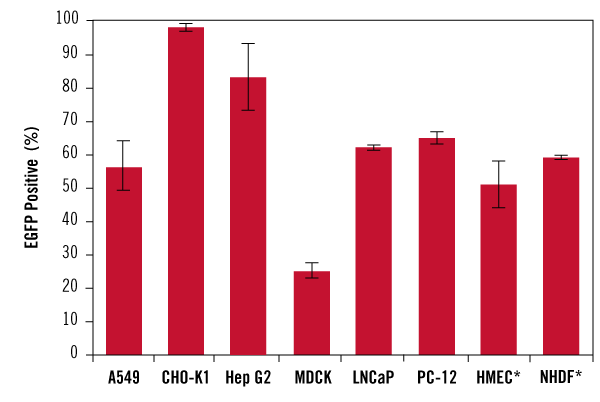 The amount of GAPDH or AHA1 mRNA was measured relative to 18s rRNA levels using qRT-PCR and then normalized to the mRNA levels of the non-targeting control, 48 hours post-transfection. Error bars represent the standard deviation of triplicate wells. Figure 5. Effective miRNA Delivery using TransIT-X2™ Dynamic Delivery System Yields Decreased Levels of PTK9 mRNA. 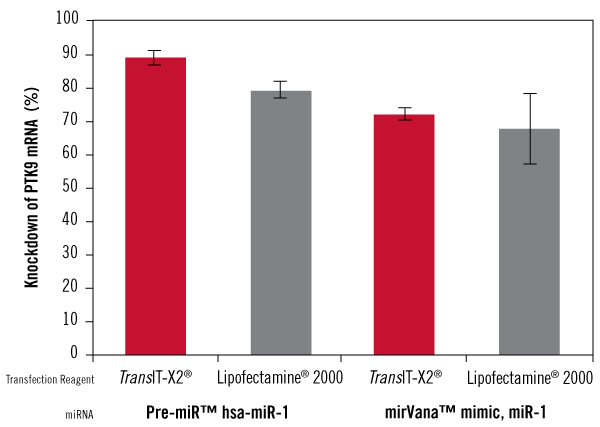 TransIT-X2™ Dynamic Delivery System and Lipofectamine®® 2000 Transfection Reagent were used to transfect Pre-miR™ hsa-miR-1 miRNA Precursor or mirVana™ miRNA mimic, miR-1, both known to decrease PTK9 mRNA levels. A Pre-miR negative control was also transfected to assess baseline mRNA levels. T47D cells were transfected in a 12-well plate using 3 µl of TransIT-X2™ or Lipofectamine® 2000 and 50 nM miRNA according to each manufacturer's protocol. The amount of PTK9 mRNA was measured relative to 18s rRNA levels using qRT-PCR and then normalized to the mRNA levels of the negative control, 48 hours post-transfection. Error bars represent the standard deviation of triplicate wells.